BetterBraces.co.uk works hard to bring you low prices. If you have found a better price for this item, at another authorized dealer, we will match it - Guaranteed! In order for us to match the price please email a link of the competitor's website to Service@BetterBraces.co.uk and we'll confirm their price is lower. We'll then contact you with further instructions. This is not an automated process, but we will respond as quickly as possible. If you need a more immediate response, please call 0800 8 048 048. Comparing the cost of a device online vs. the cost of the same device provided in a medical professional's office is not a valid comparison. As the consumer, you have to decide what is right for you and consider the trade-offs. Sure, online products tend to be less expensive – but you also lose the important services and benefits outlined above. Please make your decision carefully and, when in doubt, consult your medical provider and insurance company. Quite simply, we want your purchase to work for you. Our 30 Day Return Policy means that should you not be completely satisfied with your purchase, simply return the unused item in its original packaging within 30 days of the purchase date for a refund of the full purchase price (minus shipping & handling). BetterBraces.co.uk reserves the right to refuse to refund or exchange used or damaged products or products not in original packaging. Orders will be dispatched within 24 hours for in-stock merchandise purchased before 3pm Monday to Friday. Orders made on Saturday or Sunday will be dispatched the following Monday ex. Public Holidays. All orders will be dispatched via courier. If a product is out of stock customer will be contacted with an alternate ETA or offer of a refund. The Armor by DonJoy™ Impact Guard is designed to protect the shin and knee. The Armor by DonJoy Impact Guard is designed to protect the shin and knee. The guard also features a hinge cover, which prevents ripping of pants and/or uniforms. This is ideally suited for motor sports athletes. Made of hard plastic shell and inner foam to absorb shock. Compatible with all rigid custom and off the shelf knee ligament braces. Shop our complete selection of DonJoy products. I got my brace from my doctor, I know it is a don joy but how do I determine what model and whether or not it is compatible? It seems larger than most of the ones I see on this site. Thank you for your question. You can call product support at 888-405-3251, we can help you determine which brace you have based on color, hinges, graphics ect. daughter just got don joy defiance III post acl reconstruction surgery. I need to find shin guard to fit over brace for field hockey. Our defiance has an option for a shin protector, it must be attached to frame. You can contact your Donjoy Rep., with questions about this option. will this fit a DonJoy Defiance III Custom Knee Brace or only certain ones? i play and referee Roller Derby and have to wear knee pads and when i saw this it instantly made me want it. So i was hoping this would actually take the place of my knee pad on my right knee. Yes, the impact guard can be worn with all DonJoy rigid knee braces. 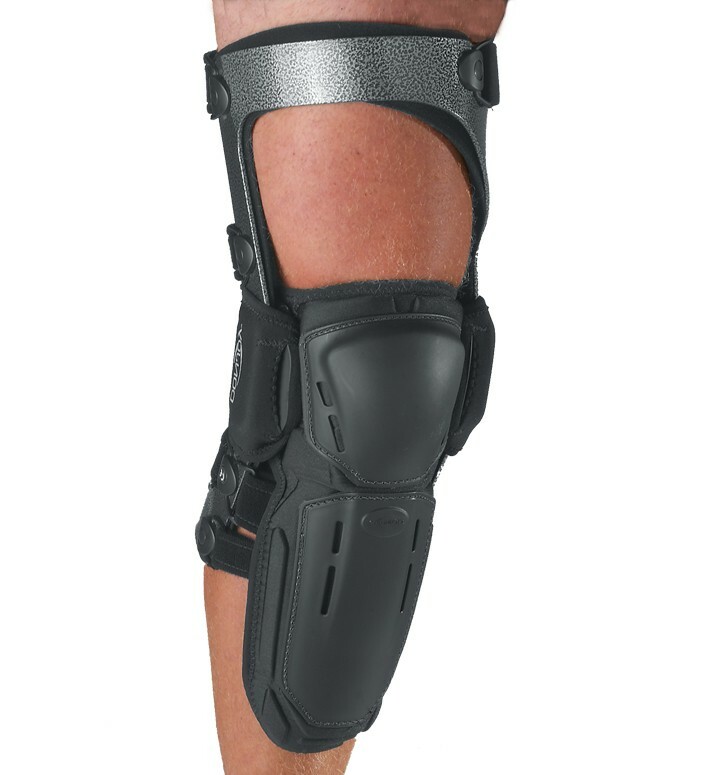 The DonJoy Impact Guard Knee And Shin Protector would protect the brace but will add un-necessary bulk to the brace. The reason this product would help protect the brace is because it covers the hinges which is most likely the part of the brace which sticks in the ground when sliding. A more suitable solution would be purchasing a brace cover. The material of the DonJoy brace cover is very breathable and will streamline the brace to avoid catching the ground. How exactly do I determine what size to order? I have a Defiance brace. Please send us an email @ service@betterbraces.co.uk with your brace serial #. With this we can determine the correct size. This Impact Guard is an add on accessory to for rigid DonJoy Knee Braces. It by itself is not a brace or support. It just adds extra protection and padding to the knee and shin while wearing a DonJoy Knee Brace. We wouldn't recommend the entire shin protector for soccer. You'd be better off with regular shin guards. Although if you needed extra knee padding while where a DonJoy Knee brace you could use this, but we'd recommend trimming the shin portion off in lieu of regular shin guard. Yes the DonJoy Impact Guard can be used for sports. It is a popular addition to the DonJoy Armor Knee brace for sports like Motocross and Skiing. If you want to remove the shin portion for other sports or activities you can do so by cutting off the shin portion leaving your knee as the only part protected by the padding.